Lauren Hanson (Sr., Redwood Falls, Minn.) averaged 3.24 kills per set along with a .303 hitting percentage as the No. 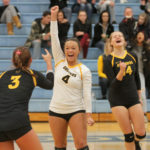 10 Gustavus volleyball team went 4-0 throughout the week to improve its winning streak to 10 matches. For her performance, Hanson has been named MIAC Volleyball Hitter of the Week for the second time this season. The No. 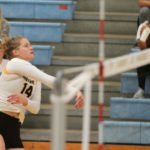 10 Gustavus volleyball team won its eighth consecutive match Friday night at the UW-Whitewater Dig Panici Classic with a four-set victory over UW-Stevens Point. 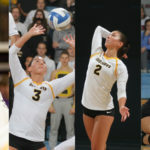 The Gusties won by set scores of 26-24, 23-25, 25-23, and 25-23 to improve to 16-2 overall. The No. 11 Gustavus volleyball team claimed a convincing straight-set victory over Macalester on Thursday night, marking its eighth shutout win in 15 matches. 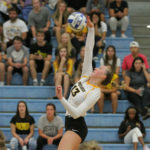 The Gusties won by scores of 25-8, 25-15, and 25-12 to improve to 13-2 overall and 4-0 in the MIAC. The No. 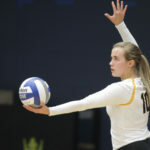 9 Gustavus volleyball team Wednesday began conference play with a straight-set victory over Hamline. 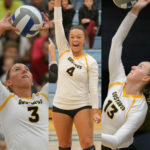 The Gusties won by scores of 25-15, 25-14, and 25-23 to improve to 8-1 overall and 1-0 in the MIAC.